Remember yesterday how I showed you a glimpse of a strange figure in a hazmat suit wandering through the woods? He only comes out of his hiding place to feed the bees. My interactions with him are solely when he’s wearing netted head gear. But we do both have hermit tendencies. But we overcome them when society demands it of us. He enjoys interacting with his bees. He fires up his wood smoker and wanders out to the woods and talks to them. 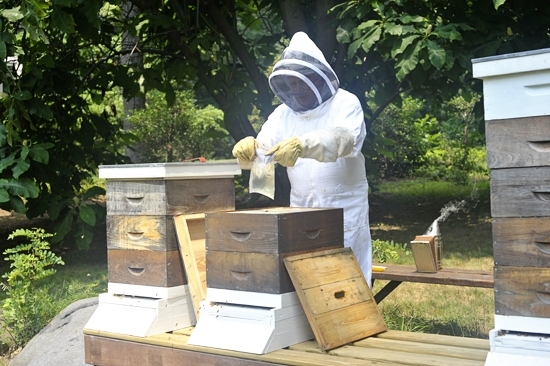 H-B-H stands for “Honey Bee Healthy.” He makes his own, but you can buy it too. It includes sugar, water, lecithin granules, spearmint water, and lemongrass oil. He feeds this to them once the honey flow has stopped. 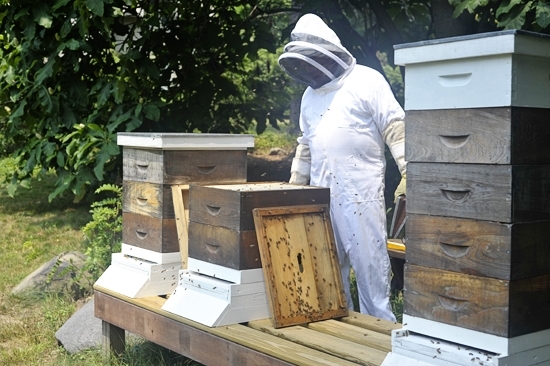 Last year he lost two hives to starvation, so this year he wanted to get a jump start and make sure they have plenty of store for the winter so they don’t starve. 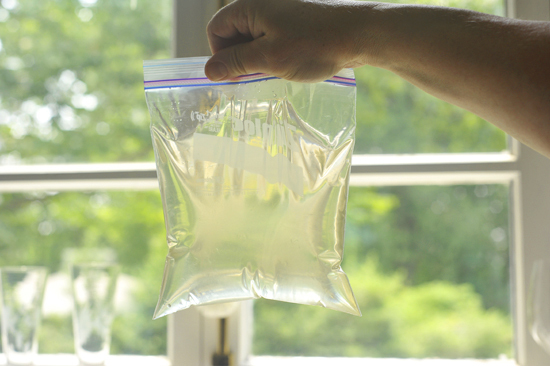 He takes a quart bag and adds the liquid after he squeezes most of the air out. Then he dons his bee suit. He has small cell bees, Russians, that come from Don “the Fat Beeman” Kuchenmeister, in Lula, Georgia. You see, the bees have been disappearing in recent years in an epidemic called “Colony Collapse Disorder,” and there are many theories as to why. My Norwegian bee friend has the answer, which has made him unpopular among the scientists. We’ll talk more about him soon, he’s utterly fabulous. A fabulous bee keeper. He sleeps in the woods with his sleeping bag in the summer, among the bees. He used to have a day job, but he likes this much better. This is the top of the baby hive, called a “nuc.” A small hive helps the new bees get started when you take frames from another hive and let some of them start over. 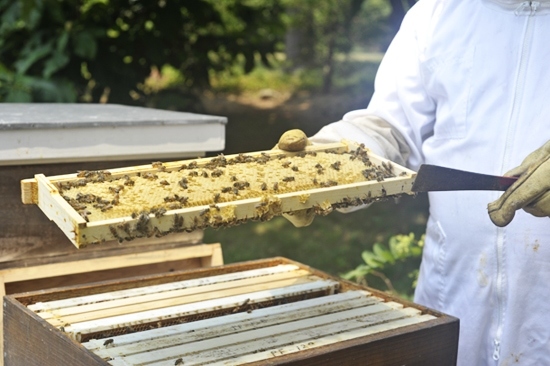 It’s called a “walkaway split.” You put a frame or two of capped brood, a frame of honey and a frame of pollen, and they make their own queen, and in six weeks they’re back up to speed. To start their own queen, they make royal jelly, and feed it to a regular bee to turn her into a queen. He lays the plastic bag over the top, lays it over the frames, cuts four small slits in it, and they come up, gather it and take it down to store it. 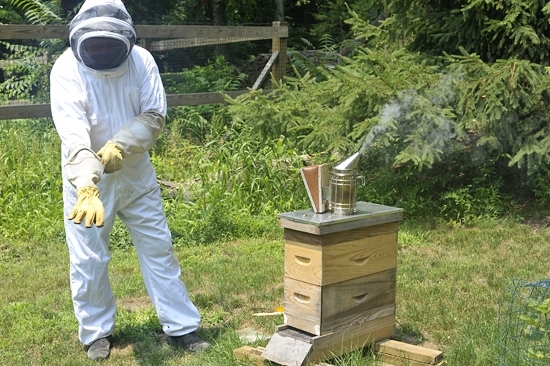 The smoke makes them drowsy so that you can mess with their hives for a few minutes. When they smell smoke they cluster together down below to protect the queen. He sands them and oils them and they last forever. “I have happy boxes,” he says. Next year he wants to try to do “comb honey,” where you put boxes in called “shallows.” They are special frames where you can cut a square chunk of honey comb out and have it with the honey. So people can “harvest” their own, so to speak. 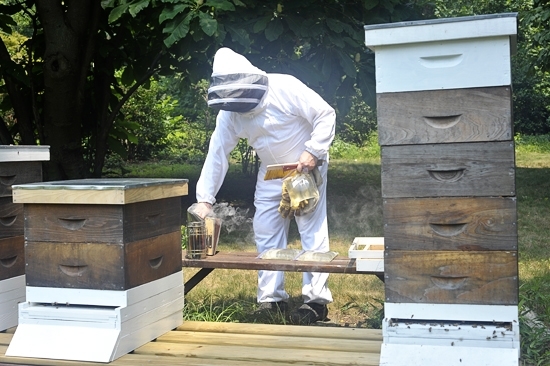 He pulled out some of the frames to check on them, since two of the hives are brand new this year. One isn’t doing as well as the other. The queen isn’t as strong. If she doesn’t lay eggs in a dense pattern, or if she lays eggs more haphazardly, then you don’t get as many bees. And the more bees, the more honey. Some of the frames have capped brood, which means they have new bees in there percolating. 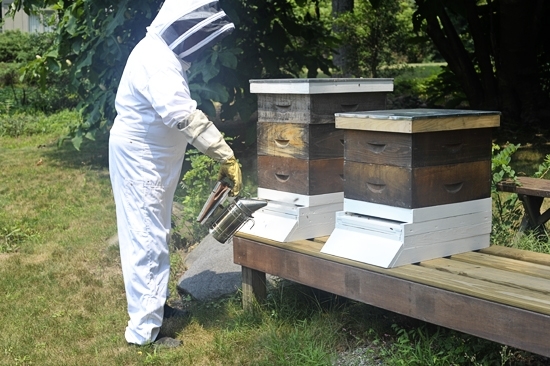 You put a separator in the hive so the queen, who is bigger, can’t fit through to go up high. That way you know you’ll harvest your honey from the top frames, and leave the bottom frames for her to lay eggs in. But these guys are doing awfully well. They don’t get any extra help. If they do too well, there will be so much honey that they will swarm and start a new hive on a tree somewhere, away from this hive. And that isn’t good. So you have to keep an eye on them and keep adding layers for them to grow into. Here is the recipe for Honey Bee Healthy that my dad uses. 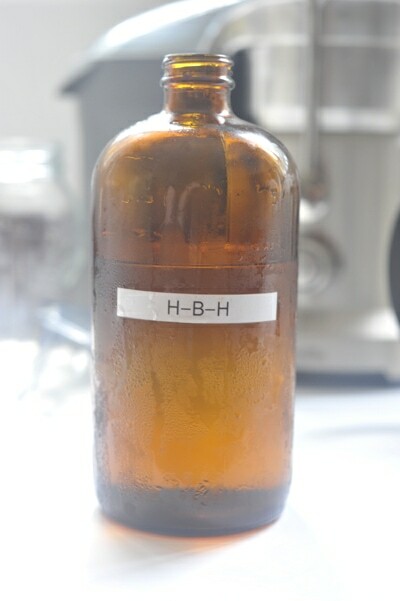 You can make gallons for the price of a bottle of HBH! Bring the water to a boil and integrate the sugar until dissolved. Once the sugar is dissolved, remove the mixture from the heat and quickly add the lecithin and the essential oils. Stir until everything is evenly distributed. 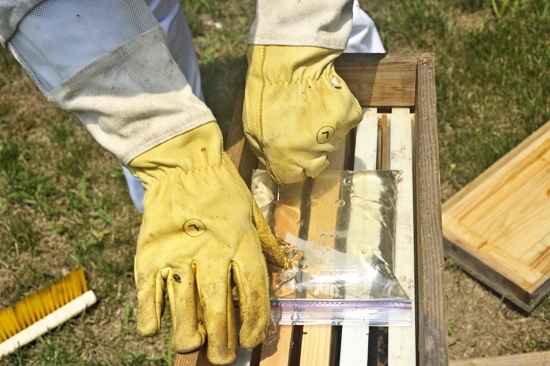 This solution should have a strong scent and not be left open around bees. Cool before using. What an idyllic place Tulipwood seems to be. Your family is blessed with many talents! 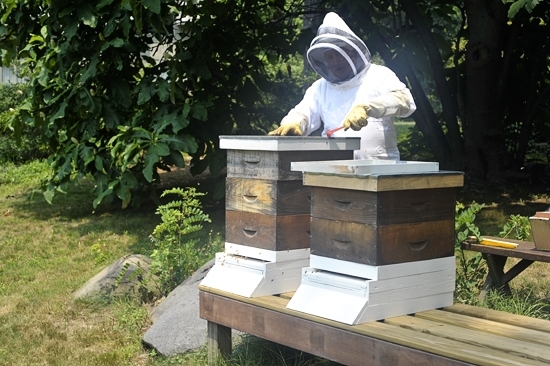 Our family berry farm has a 'bee guy' that brings out hives to pollinate our berries. 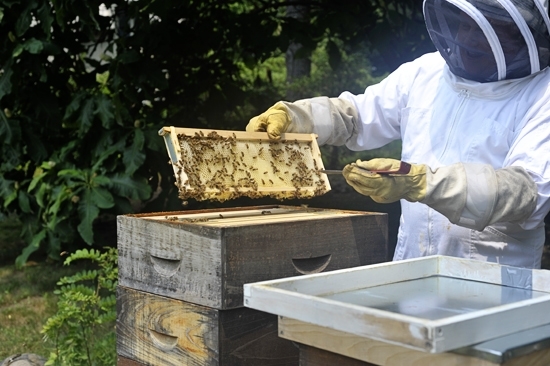 We love to get raspberry honey at the end of the season from our bee guy. Oooh, how great! We get a lot of tulipwood honey as you can probably guess : ) What kinds of raspberries do you have? I just had some of the first yellow raspberries here today and they were so wonderful! Golden raspberries are so ooh la la! We had a test plot of those for awhile. We have Willamettes and Meekers. Willamettes are sweeter, but Meekers IQF better and stand up to mold better so that is what we mostly produce. 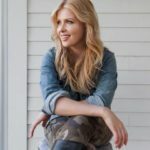 Georgia, I just love your blog. This is wonderful! Can't wait to hear more about your Norwegian bee friend. "I think it's the alarmingly phallic nature of the clams that was a little surprising for people." Georgia – I work for LorAnn Oils and wanted to share with you that although we do not sell any "finished" HBH we do sell the lecithin (liquid), spearmint and lemongrass oils used in your recipe. How much do u give them at a time? My husband and I just started with bees this spring, and we are still learning? Sorry, I just read the last post! It’s a recipe my dad uses, I’m not sure what the Fat Bee Man uses but I think he has a website! He’s in Georgia. Could you please tell me what exactly the essential oils are for? One of our friend beekeepers uses peppermint oil in his syrup and says that it keeps the syrup from spoiling. Lemongrass oil is used as an attractant for bees so I was just wondering what the essential oils are for in the H-B-H. I am anxious to try this on our bees, but noticed that you said that the syrup should not be left open. We feed our sugar syrup in top feeders that only have the telescoping cover over them. We had to put fine screening wire over the top to keep the bees from getting in from the top since they are supposed to come up from the bottom and walk down the center barricade/opening that is covered in finer screen wire that is immersed in the syrup. Hope you can enlighten me. Great site just found it today you said your Dad sands and oils his cypress bee boxes what does he oil them with that would be safe for the bees ? I have bee looking for some to replace paint. I was wondering about the amount this makes.. Is it just over 5 cups, or does this make a gallon? LorAnn Oils has the liquid lecithin, not the granules.. Would that still be 1/8tsp, or more or less? 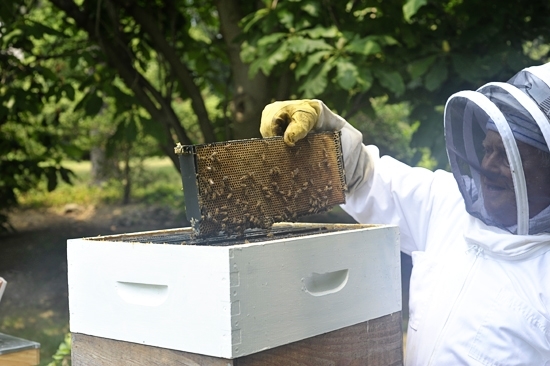 I hope I can find the article about the Norwegian Bee keeper who thinks he can save the bees.. Cheers.. Thanks for the article.. Sorry about the all caps.. Can’t turn it off for some reason. can you use peppermint as a substitute for the spearmint? You can read more about him in my book “Food Heroes” which is available in my shop or on Amazon! He’s wonderful and fascinating. Just trying to understand, do you feed this directly in feeder, or is this concentrate that you mix In with Syrup (e.g. 2TB / Qt) like HBH? I have the same question. If it is a HBH substitute, is it a concentrate? Or is it milder than hbh so that it’s an enhanced sugar syrup feed recipe? I like your elusive father and love his oiled hives. would comment that boiling sugar water or pouring boiling water onto sugar can create caramelization that is said to be potentially harmful to bees. 140 degree water seems to be safe and dissolves sugar easily. came across this post while randomly surfing for bee feeding – looking forward to exploring the rest of this site.